EASY TO USE - Only a second, stay beautiful all day long. No more accessories. 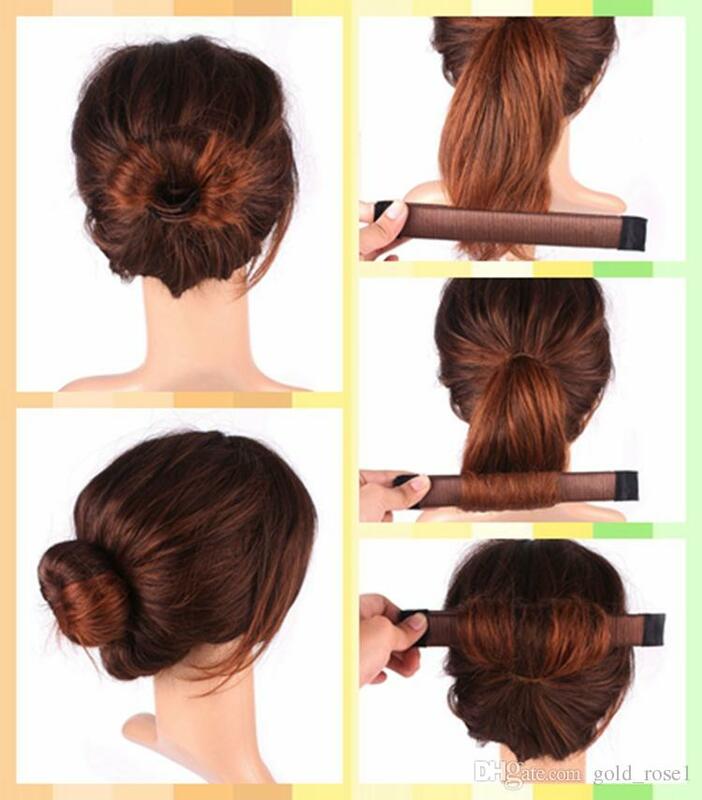 Sandwich your ponytail with the tool, roll up to the base, and snap to a perfect bun. NEAT ALL DAY - Won’t fall down for daily activities such as walking or jogging. Keep your hair off your neck and face in hot summer. LIGHTWEIGHT - Do not hurt or add more burden on your hair. It is made of a synthetic wig and flexible wire. Work as a hair accessory, it feels feather-light. PERFECT FOR ANY OCCASIONS - Daily Life, School, Night out Party, Wedding, Graduation, Prom, Ballet Recital, Yoga Practice and Much More. same as photo but it can actually be slightly darker m.e. suitable. time reasonable i recommend! came parcel within 28 days. all like the picture. pin comfortable. Fast shipping, good product. I try it, it can hold my hair strong. The color is bit darker than picture. well packed, color correct, Shipping rapidísimo tan 13 days. now learn I have you use it, will onward More comments after taste. Received after a moth of ordering. Works fine but needs more practice. perfect! almost perfect bundle a. need practice, of course. very easy to use with rubber band. decent pin, is not very big. with long straight hair will be easier. all s cascade drop beads strands, поправлять account. Received in 3 week but a little hard to early works pretty good. one or two bobby pins it perfect. Very good. at first i struggled to find how to use it, But I could. Excellent. i will try them. nicely emoaquetado. thank you. exact color. Came in 3 weeks. Colour is good. Everything is ok. Thank you. 15 days delivery! product like in description! 100% recommend ! Fits the description. tsvet as in the picture. in fact, not yet tried. Really nice. Quick delivery and comfortable for use ! Thank you seller ! Parcel arrived quickly. interesting clips, turned out only the tail is do it is necessary to train) on long hair easy to spin. and fixing it is a great option for the price. I recommend. looks ok. not a lot of hair on it, and the hair is really shiny, looks cheap. This came really fast and the seller shipped it fast. It is pretty difficult to use, but it did work as described. I used it in my hair and it made a bun. My hair is really long and I feel like it may have been harder for me to use because of that. i don't know if my way is right. I manage to make a half donut shape. The Hair Donut band has a lovely color. Maybe i will repurchase. Cool hairpin I order 2 times, first gave his sister, the same yourself again ordered very comfortable, sent to sled. den came for 3 weeks In general I am happy, everything's cool, the seller-well done!!! I received my package in 26 days which is normal for a trip China-Belgium. Thank you very much to the seller, the two headbands are in perfect condition. On the other hand they are fragile about the false hair but it is not annoying. You have to train a bit before mastering but it's nice. 2 weeks arrival good quality. very convenient and simple to use! Excellent! as expected the black Hair barrette is not visible. the hair made in haste. keeps excellent, I recommend!